Surrounding yourself with growth is the great success lubricant. If you want less friction, easier money, and a fast track to accomplishing greatness, you must immerse yourself in growth. Unfortunately, this principle is often overlooked, and people spin their wheels in low-growth cities, waste their time with dull friends, and torpedo their future by working at the wrong company. Pop quiz! How is the “growth factor” affecting your career, your business, and your success? Take the quiz at bottom to score your own growth situation. If you’re surrounded by growth…you’re in a growing business, in a growing city, and hanging out with friends who are growing, your houses are appreciating…you can probably be a slacker and do awesome things in life. If you’re a Grinder fueled to achieve greatness, you’ll explode. If you’re not surrounded by growth…your company is in cost control mode, your city is old and stagnant, and your friends are happy be stuck in their same old job…well, even if you’re awesome, you’re going to struggle. You’ll be fighting to swim upstream. Everything will be more of a challenge than it needs to be. Are you on easy street or fighting upstream? How do you get into a better situation that matches your vision? Surrounding yourself with growth greases your chances of hitting it big. It reduces your risk, connects you with right people, and fuels your enthusiasm. 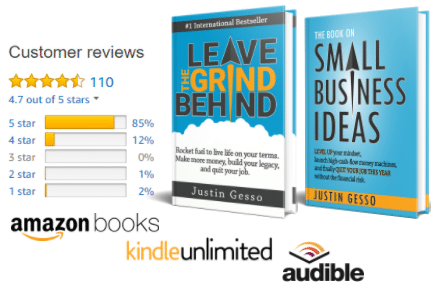 By the way…if you like the concepts in this article, be sure to check out my bestselling book Leave the Grind Behind. If you’re joining a business, becoming a consultant for someone, or investing in an area–you should look for one thing: growth. For example, if you are considering two job offers, a massively important selection criteria for you is to determine which company is growing faster. Shrinking companies have problems. Steady-state companies have problems. And yes, growing companies have a lot of problems. But they have good problems. Getting in a business environment that is growing can teach you massive amounts about how to scale a company up. It can teach you effective marketing and sales. And since the company is growing, you will be more indispensable and more likely to be called upon to take on more and more responsibility. Exchanging your time for percentage pay (awesome) is massively more likely. Additionally, you’ll find many other side benefits. Employees are generally happier, money flows more freely, ideas and brainstorming are embedded in the culture. The same goes if you’re consulting. Don’t take any consulting customer. Work with those who are growing. You’ll be less likely seen as a cost or more likely seen as an asset. You can grow your consulting business with a growing customers. Have you ever worked for a company that is downsizing or constantly controlling costs? All of the growth benefits I just described above flip on their head. People are in foul moods. Layoffs are common. Employees are competitive, bitter, and gossipy. Everything is a cost waiting to be cut. You may get more work and more responsibility, but that’s just because your coworker got fired. You are taking that on in exchange for more money or a promotion. Sure, you can learn great tools for keeping a business lean in this environment, but it’s hardly worth it. 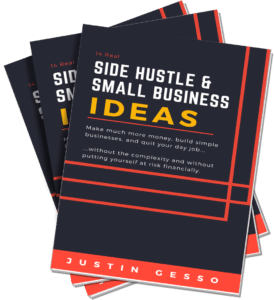 A great step many people can take toward being in business for themselves is to join a startup or very small business. Go for growth. Companies that are struggling or are literally at Day 0 represent considerable risk. Unless you’re in a position to risk a lot of time and money, step into a startup that has some track record of growth under its belt. As you progress down your success path and become more and more of a Grinder, you’ll be able to take bigger risks. But if this is your first step, consider the big picture. As Tony Robbins would say, most people overestimate what they can do in 1 year, but underestimate what they can do in 10. Take those words and work your way toward creating your own awesome business. If you work in a big corporation today, get closer to your goal by working for a growing startup. Growth applies to many other facets of life, including investing. For example, if you’re investing in real estate, consider the long-term potential of the geography. Are there reasons for people to continue to move in? Can new home building keep up? Are there good sources of jobs? Many real estate investors focus on cash flow, which is the monthly money they’ll receive from a property. But while this is great passive income, it won’t make you rich. If you buy houses in growing areas that not only cash flow but also appreciate, then you will become rich. I have a great friend who is an expert investor. After spending years picking better properties than others in our circle in terms of cash flow, yet seeing everyone else get richer, he decided he needed to make a big move. He needed to pack up, sell all of his places, and move halfway across the country to apply his knowledge in a geography that was growing. It’s big moves like this you have to be willing to take. How do you rate? Evaluate your situation and make a big play if you want big results. Rate your company on its current growth. This applies whether you work at a traditional company, a startup, or for yourself. My company is in downsizing mode and has been that way for a while. Layoffs are common. Layoffs are in the air. New spending rarely happens. The company is constantly making changes but never really stepping forward. The company is fairly stagnant. It has a solid base and cash cow, but isn't really leaping forward. My company is growing fairly well. We add new customers and revenue. Our problems are related to how to handle all of the extra work and challenges that come along with expanding our systems. Growth is in the range of 20% year-over-year. My company is exploding. We are not only getting many new customers, but we have numerous new offers of products and services that the market is devouring. People are buying our products and services before they're ready. Marketing and sales is paying off big time. Our challenge is in meeting the demand and systematizing. Rate how your geographical location is changing. This has far-reaching impact to your ability to grow a business, invest, and meet the right people. Note that you don’t need to live in a big city, just a growing one. My town is small and has been that way for the last 50 years. There are no big companies here. Things mostly stay the same. My city has numerous large companies that keep hiring. These companies may be stagnate or growing, but they're solid fixtures. There is variety, diversity, and vibrancy to where I live. If I want to meet movers and shakers, there are plenty for me to choose from. I live in a boom town that is rated on some place like Forbes or The Street as a top growing city. There are ongoing job and business prospects, making this an in-demand location. Rate your network in terms of growth. The people I hang out with and have access to are Cogs. They go to jobs they don't like. They've been at those jobs for years. They don't make changes or take action. They complain. I have a mix of people in my network. Some are growth oriented, but many are taking a standard approach to life. There are numerous clubs, groups, and societies in my area that I can join to gain access to an even broader network. I hang out with growth-oriented people who are making much more money than me and maintain happy, fulfilling lives. I am part of clubs, groups, or societies that allow me to interact with people who share a growth-oriented mindset and are real movers and shakers. Awesome! You have no excuses to achieve greatness. If you want to commit with success, you need to uproot your situation.